It has nothing to do with following one persons words (Ra Uru Hu) by the letter, or even the Human Design framework ‘to a fault’. 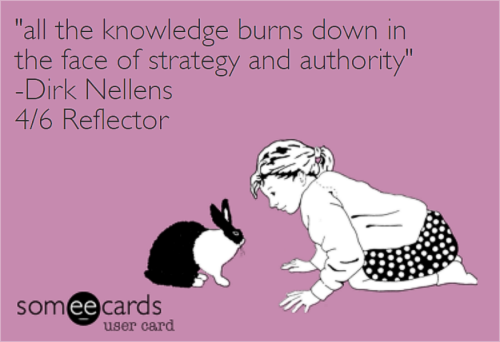 It is about seeing that “all knowledge burns down in the face of Strategy & Authority” and having seen that, experienced it. By tinkering with it, to add or subtract, we’re tinkering with knowledge alone. For instance I’ve been in several GeneKeys DeepDives, was live in London with Richard and others just before the book got out, did GK Host and Guide training, was asked to become a GK Guide, and had a great time exploring my emotional world through it. It was incredibly valuable to me and everyone else I know or came in contact with. But as I also deepened my experience with HD I came to see, that not HD, not Ra, not GK, not any of it, not PHS, not this economic framework or that political philosophy, not Advaita Vedanta was key, but S&A was, my S&A for me, by me. It truly holds everything, to make those decisions by yourself, which is often times not even decision -making- but realization of what is correct. The dawning awareness of that reality. And that there is nothing wrong with someone telling me this. While more and more HD people shake their heads and become more and more silent in FB HD groups because of the enormous influx of people indeed wanting to mix, or as they fear the no choice dilemma, to at least have the option as they then cling to it and defend it ferociously, but not creating their own mix groups, but instead just take over the conversations, loud, arrogant, obnoxious, as they promote their mix, and then another mix, and yet another other with another mix. Mixing it, is not experimenting with it. Hiding behind others and become false group thugs is not you living it. Writing their own books, giving more, giving less, changing this, changing that, while standing on the basics of HD, while trampling it all the same. 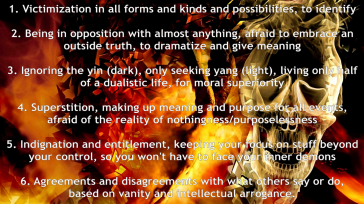 Ignoring the pearls from within it as changing one word or syllable has more importance, than -living- it or learning to, as their ego’s are boasted by the people that buy stuff from them, thinking both parties are on the right track, of manipulating life, of creating shortcuts to salvation and the end of their suffering. I’ve had access to tons and tons and tons of HD and mixed or altered information, and to see, not just for me, but for so many others too, that even pure HD info is not the key, the information is just a drug (gateway drug?) is just for the mind to think it can outsmart life, pretend to change the mind with more/better information. And Ra was the pusher of it, by popular demand. And then mind make all these and those connections, and thus indeed combine structures, insights, frameworks. Until *plop* hey, wait a minute, more info is not supporting actually, it is aggravating, it is steering me in an ever more mental direction of thinking to know, to -understand- but it is a lie. I don’t need more -information- to make my decisions, I need to find out what my decision -IS-, first, without my powerful mind, and listen to that body consciousness, and follow its directions. I don’t need to know what Color 3 -means-, I need to -live- it. To apply it, use it, and see how it responds, reacts, struggles, and observe that, notice it behaving. I don’t need to know what Gate the Moon is in right now to live it. Yes it is awesome to understand what energies are present right now, how I sample life differently, right now. But -knowing- what Gate it is in, does not change how I -experience- life, right now. -edit- it actually does change the experience, but not for good, cause it steers the focus, it limits the openness of observation, because of pre-conceiving the experience, of setting the mind up for how the experience should/might/could look like in the first place. “Look at me, I’m pointing at the moon”, they say, look I changed HD and mixed it with this and that, want to hear my recipe, my version of how my mind made it -seem- better, so you can seem to feel better about it too. In your head? No matter if you are called Richard Rudd, Karen Curry/Parker, Steve Rhodes or Juliane Hahn.